The first Adventist workers to come to Poland were J Laubhan and H Szkubowicz, in 1888. The Polish Union Conference was organized in 1921 and has 117 churches and 5,800 members. Today, Adventism is the fourth largest Protestant denomination in Poland. Marian was born in a little village in the country of Poland [locate Poland on a map]. When he was a newborn baby, everything seemed to be OK, but by his first birthday, Marian’s mother and father noticed that something was wrong with his eyes. He didn’t look at them, and he tried to find his toys by feeling for them instead of looking. Soon, they learned that their little Marian couldn’t see anything at all—he was blind! They were very sad and decided to take Marian to live with his grandmother because they had to keep working on their farm. They knew that his grandmother would be able to spend more time with Marian and help him. Marian’s grandmother loved him very much and took good care of him. She also loved God and taught Marian to love Him, too. She often read the Bible to Marian and taught him God’s Ten Commandments. Marian loved listening to his grandmother read the Bible and he memorized many Bible passages. When Marian was nine years old, he went to a special school for blind children, called the Laski Educational Center. At this school Marian learned how to read with his fingers! His teachers gave him a special paper with raised dots on it. These raised dots represented letters, words, numbers, and more. 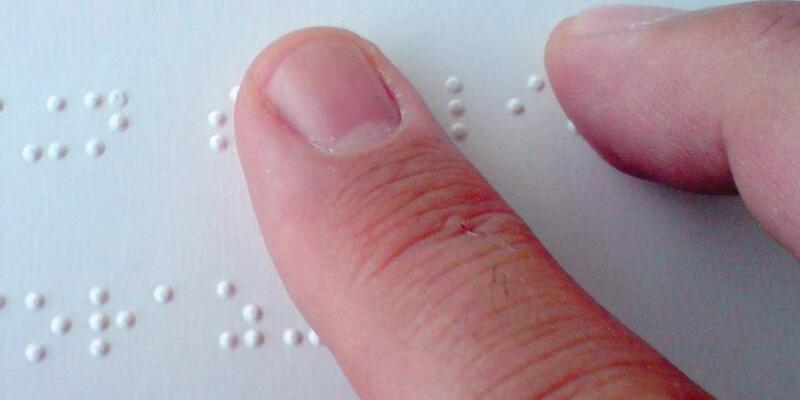 He was learning to read Braille. With some practice, Marian was soon using his fingers to read lots of things! It was very exciting for him to be able to read and to learn many new things at this school. Marian went to school at the Laski Educational Center for many years. After finishing primary school, he continued at the Laski Secondary School (high school). One of the classes he took was a religion class. One day he decided to ask his religion teacher about something that had been troubling him. Marian had noticed that the Ten Commandments that were taught at the school were different from God’s Ten Commandments that his grandmother had taught him from the Bible. At school, the second commandment about idols was missing, and the tenth commandment about coveting was broken into two, so part of it was the ninth commandment, and part of it was the tenth. This didn’t make any sense to Marian, especially after he read in the Bible where Jesus said, “Do not think that I came to destroy the Law or the Prophets. I did not come to destroy but to fulfill. For assuredly, I say to you, till heaven and earth pass away, one jot or one tittle will by no means pass from the law till all is fulfilled” (Matt. 5:17,18). “Because God gave the Catholic Church the power to change His law,” said the teacher. But Marian knew that couldn’t be right, because the Bible said no one could change God’s law! He decided that he would always believe the Bible. Marian is very happy about his decision to always follow the Bible. Today he is a Seventh-day Adventist and is a Sabbath School leader. He studies his Sabbath School lesson every week. He also listens to Hope Sabbath School on Hope Channel Poland. Our Thirteenth Sabbath Offering this quarter will help the people at Hope Channel Poland to have a studio where they can make more programs to help Polish people to learn more about Jesus and His Word—the Bible.